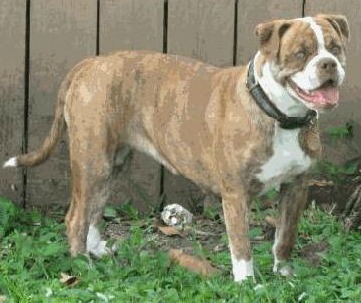 Alapaha Blue Blood Bulldog. A rare breed of guard dog. most affectionate guard dog you'll ever meet! 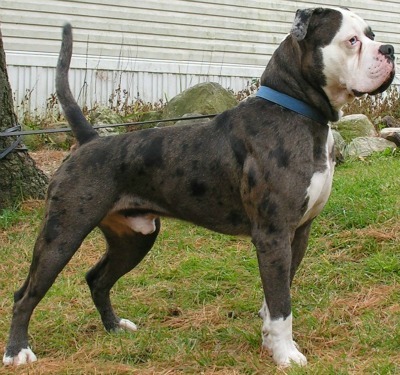 The Alapaha Blue Blood Bulldog has a fantastic temperament and gets on extremely well with children, although they can be a little aloof at times. 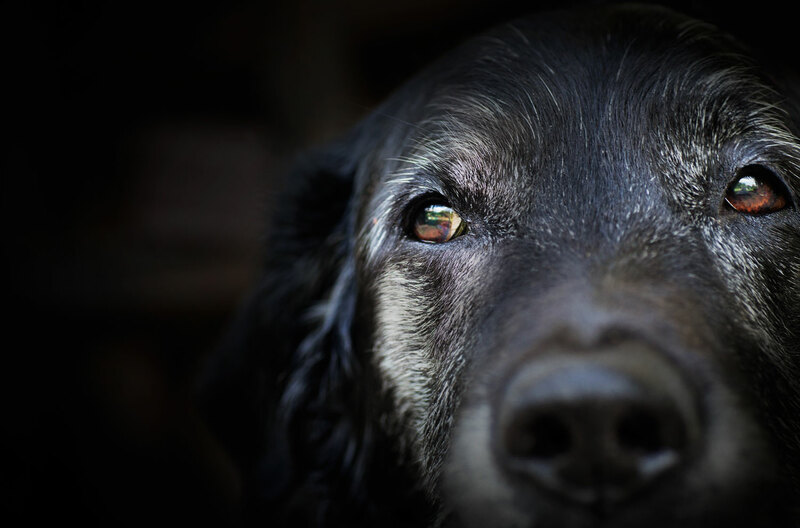 They are a loyal breed who also make brilliant guard and companion dogs. They are stocky, athletic dogs who are very muscular. 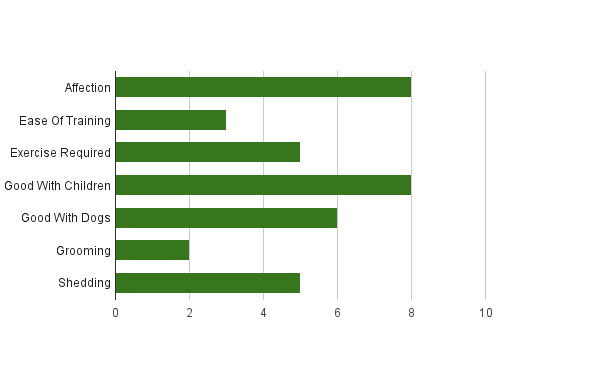 And, despite their appearance, they don't drool either! (Apart from after drinking water, as all dogs do). Neither do they suffer from breathing problems, unlike their English Bulldog counterparts. They can be playful clowns, as this YouTube video below shows! These beautiful rare dogs have a very interesting past. 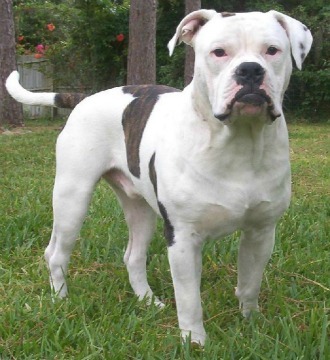 They were originally bred by one family who lived near the Alapaha River in Southern Georgia in the United States. 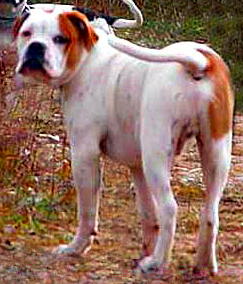 The family were aware of how the breed of the “Ol’ Plantation Bulldog of the South” were dying out and took it upon themselves to rescue it by constructing a breeding program of three generations to save the breed of dog which had been in their family for around 80 years – a dog they always named “Otto”. In fact, the breeder Papa Buck Lane's granddaughter, the late Lana Lou Lane, was quoted as saying there was always an “Otto” dog running around her granddaddy's estate for as long as she could remember! Papa Buck Lane began the breeding program as he not only wanted to save the breed but he wanted a great guard dog which would also make a wonderful companion dog for himself and his family. 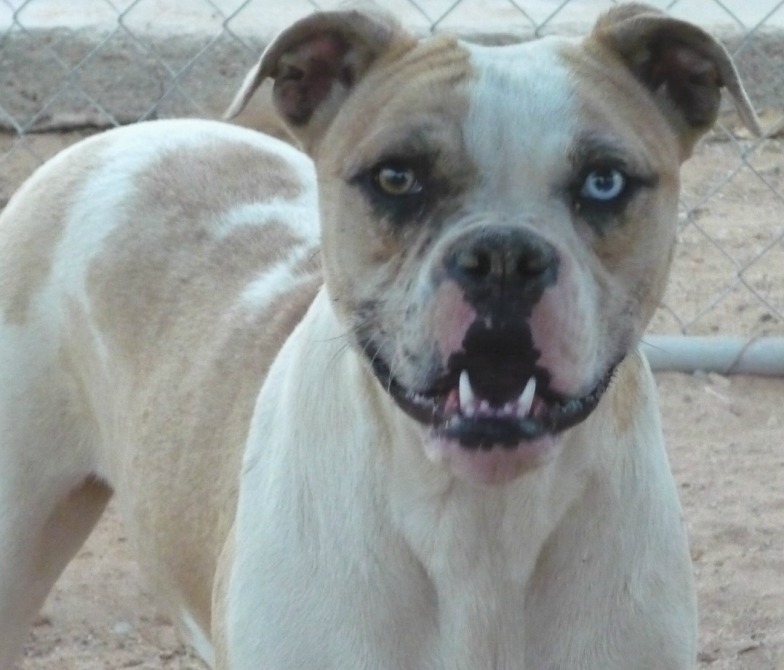 So in 1979, the Alapaha Blue Blood Bulldog's numbers were increased using the Ol' Southern White (White English Bulldogs who arrived in the US in the 1700s), Catahoulas and a small amount from Colby Pit Bull Terriers. Some records tell that the thought-to-be-now-extinct Mountain Bulldog was also used. Unfortunately, in 1943, Papa Buck Lane was hit by a train and died. 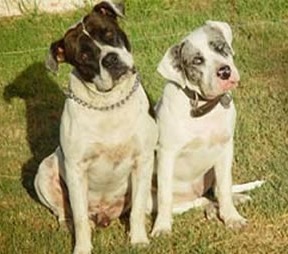 In a true Alapaha Blue Blood Bulldog show of loyalty, Otto often visited Papa Buck's grave to guard it. Lana Lou Lane then took over her grandfather's breeding program and in 1986 she got in touch with the ARF (American Research Foundation) to request help and information on how to increase the small number of dogs she had in her care. The numbers duly increased and now there are Alpaha Blue Blood Bulldogs all around the world thanks to the hard work and dedication of the Lane family. This is imperative to cut down on hostility in your Alapaha from an early age. They should be socialised from as early as possible for the same reason. If raised correctly, your ABBB will be a wonderful companion who will protect you and your family only when required and without any undue aggression towards strangers or other dogs. 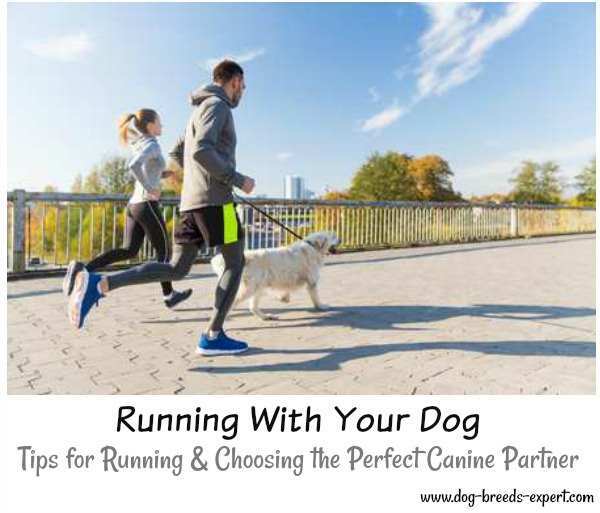 They are not particularly active when indoors and although they are athletic dogs, a large enclosed back yard or garden may be sufficient for their exercising needs. They like to run around and play once outdoors as well as going for long walks on a leash or harness. 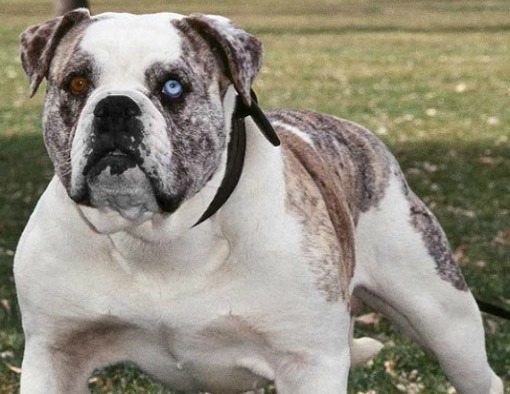 Although Alapaha Blue Blood Bulldog's were originally bred from Old English Bulldogs which were a working breed, they have been bred specifically for protection and companion dogs as their main aim. They are excellent protectors without being aggressive and will fight to the death to guard whatever or whoever they have been asked to. They've often been described as the most affectionate guard dog you'll ever meet! Thanks to their short, stiff, glossy coat, ABBB's require little grooming. A quick brush once a week should be enough to help the dog to remove dead hair to reduce shedding. Although, as average shedders, you wont be inundated with dog hair! Bathing is only required when necessary to keep your doggy friend smelling sweet. Oh and their tail should be left natural too so no docking required. Apart from that, there's not much else needed for this breed! 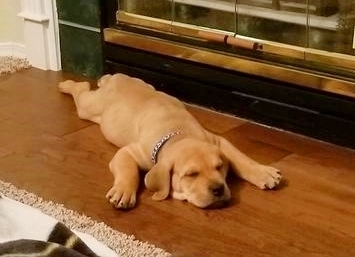 Otto - the dog who started it all off! You could find out about other Dog Breeds in the A To Z List with photos or perhaps you'd like to check out more Bull Dog Breeds?